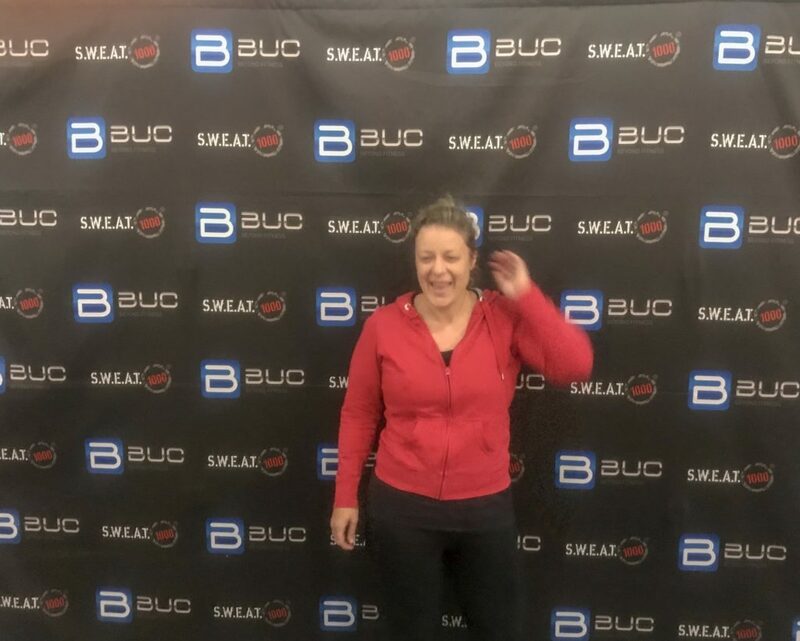 I found myself sprinting on the treadmill faster than I have ever run on a treadmill before, the sweat dripping from every pore, while the D.J pumped the night club music and our instructor kept on manically shouting words of encouragement at us. Most of my fellow classmates were ridiculously attractive women, with sculpted and toned bodies wearing perfectly co-ordinated, expensive and stylish gym attire. I obviously fitted right in. For some-one who loves to be outside in nature with wide open spaces and fresh air this should have been my worst nightmare but because the endorphins from a proper workout at SWEAT 1000 were kicking in, I was loving it. 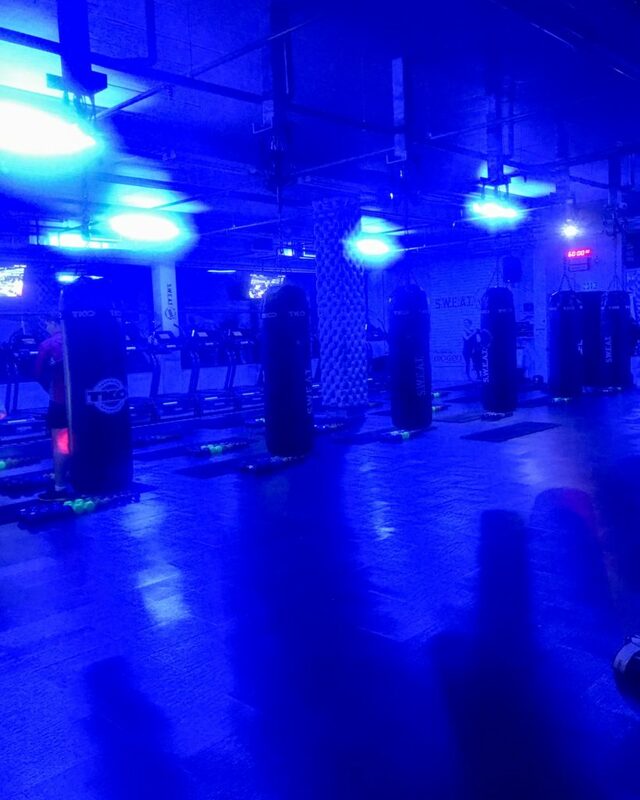 Is this a gym or a night club? 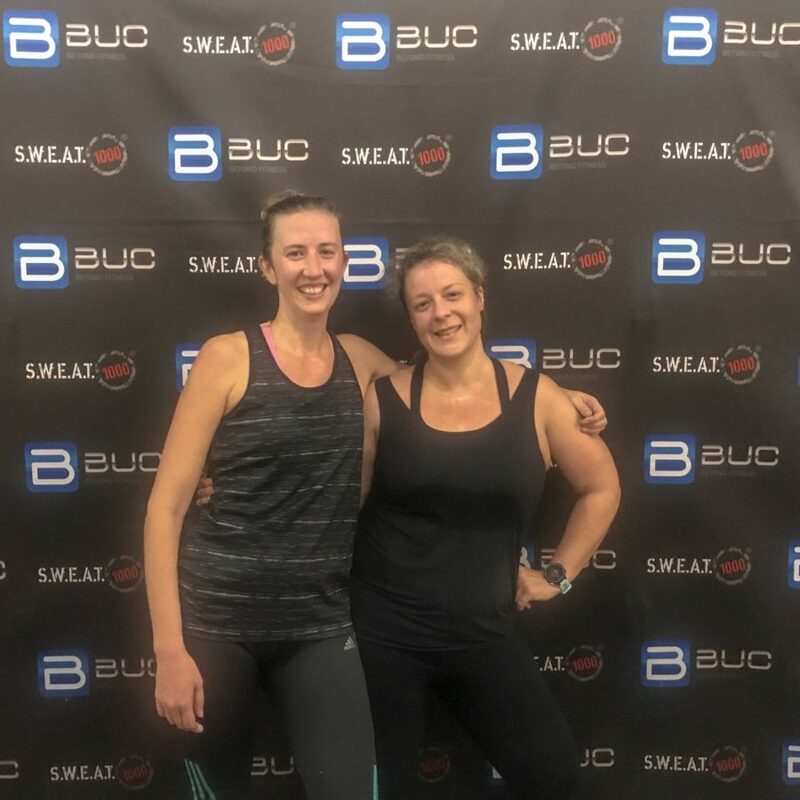 SWEAT stands for Specialised Weight Endurance Athletic Training with the 1000 representing the estimated calories burned in a 1-hour workout. The workout integrates the components of interval training, functional training, core stability work, athletic training, and agility training. They change the format of the class every time to mix things up for those regularly attending. You alternate between the treadmill and floor work with and without weights. Our class also had the bonus feature of some boxing with gloves and punching bags which was such a great workout for the arms. Overall I found the experience to be incredibly motivating and fun. It was also far more manageable than I thought or maybe I am just fitter than I think I am. I am a slow runner with exercise-induced asthma so I wasn’t always able to run at the speeds they suggested but I was just below it and able to push myself pretty close to the target. But more importantly I kept running and only rested when they gave us a break. It was also hard for me to gauge how hard I should be pushing myself because it was the first time I had done the class. I was able to do all of the floor work including the push-ups, sit-ups and jumps. But that is definitely thanks to the bizillion planks and core exercises I have been doing in my weekly yoga classes. It really doesn’t matter what exercise you do, anything is better than sitting on the couch. Be open and adventurous to try new exercises and workouts. Find something that works for you, that you love, that you can share with friends and that you can keep doing consistently. Weights. Running shoes for the treadmill. SWEAT 1000 has two Cape Town branches: Sea Point and Claremont and they operate in Johannesburg and Houston, Texas. This model of working out is all the fitness craze at the moment so hopefully there should be something similar in your neighbourhood or city. Cape Town also has the Switch Playground and F45 Training. 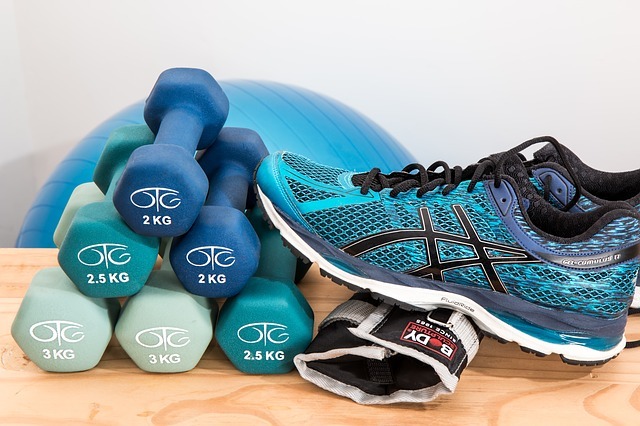 I think you need a basic fitness level to be enjoy the class and have some familiarity with how to use hand-held weights and do basic floor exercises. My class was about 20 people and it was impossible for the instructor to focus individual attention on anyone. Although it was predominantly women there were more men than in my yoga classes and even one guy who must have been in his 60s. It was so much fun going to the class with my friend Carrie especially in our every day non-perfect workout gear. I usually like meeting up with friends for exercising because it holds me accountable. Bring a towel for all the sweat and a water bottle. Wear running shoes. Show up at least 15-minutes before class to sign the indemnity form. You will also need to go into the class room early so the instructor can explain how the set-up with the treadmill works. You are constantly working with the treadmill as you push yourself on speed and incline. There are also 3 different levels for participants on the treadmill which workout at different speeds. I was at the beginner level and it was tough but I am not a runner at all. You sweat and workout for the full 60-minutes pushing literally right until the end. Then there are a few minutes for cool down afterwards. I really liked the fact that the instructor does not force you to do anything you are uncomfortable with. It’s really up to you how hard you work out. I still remember a friend of mine getting badly injured and tearing a muscle in another type of group fitness class (which shall not be named) when the instructor forced her to lift weights passed her comfort point. You can also leave at any point during the class which a few people in our class did but not me. The point is to try to last until the full 60 minutes to get maximum benefit. The SWEAT 1000 classes are not cheap. If you are a South African citizen then the first class is complimentary. But if you consider that they are about 1/3 of the price of a personal trainer and offer a solid 60 minute plus comprehensive work out then for those who can afford it, it’s worth it. You can book classes on-line but to book the complimentary first class you need to book via the phone. For more information and to book see SWEAT 1000. The before picture. Naive smiles. The after picture. Dripping with sweat with my friend Carrie.